First impressions are everything and the invitations you choose to present to all your loved ones should tell your love story and set the tone for your entire event. Whether you choose custom designed or from Creative Destiny’s curated line, your wedding stationery is sure to impress. 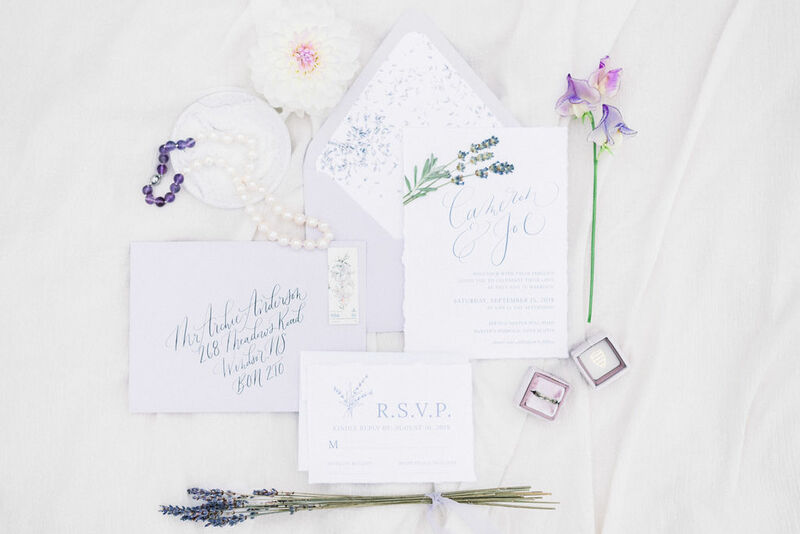 Dreaming about custom wedding stationery? We will discuss your colours, concept and inspiration to decide which papers, script styles and artwork are right for your big day. Once everything is designed and your printed proof is approved it will be printed and assembled by hand to make sure everything is perfectly presented to your guests. If you are on a budget or planning a small wedding, that doesn’t mean you have to compromise on stationery style! I can suggest design options based on your wedding style or you can browse through Creative Destiny’s collection of curated stationery and have anything personalized with your choice of colours and paper for a custom look. After your invitation suite is complete and RSVP’s have been returned, it’s time to have fun planning your wedding day stationery. Programs, signs, seating charts, tags and table numbers are a great way to complete all the details of your decor. Your guests are sure to notice all the attention to detail!